Never observe the sun without proper precautions. This picture was taken near the height of the sun's 11 year cycle, and more sunspots are visible here than normal. A sunspot appears darker because its temperature (~3800K) is cooler than the rest of the sun's surface (~5800K), called the photosphere. Each spot has an inner dark umbra surrounded by a half shaded penumbra. The largest sunspot in the upper right of the main image is approximately 50,000 miles across, which is 6 times the diameter of the Earth. 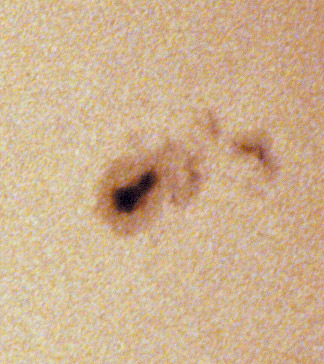 An enlarged view of that sunspot is presented on the right. Sometimes a spot lasts only for a few hours, but very large spots occasionally grow and last for weeks or months. 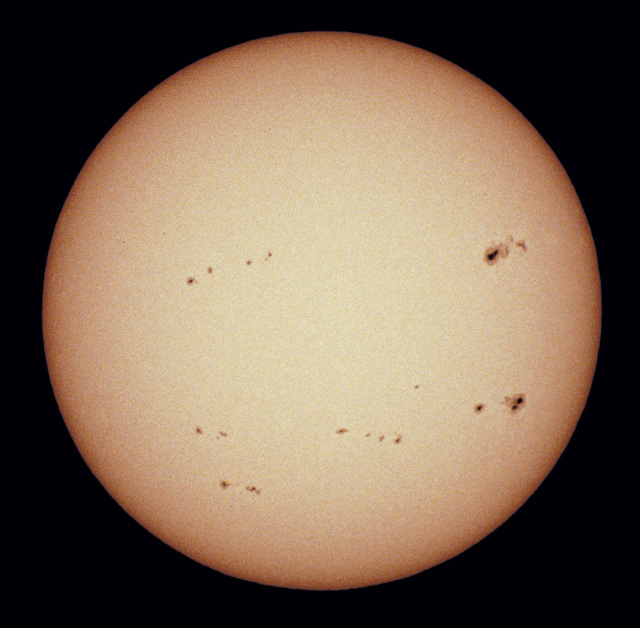 Sunspots usually appear in pairs, as can be seen here. Sunspots are indicators of small twisted loops in the sun's magnetic field. The photosphere's granular appearance is apparent in this photo. For further reading, see Herbert Friedman's "Sun and Earth" (available at http://www.alibris.com) or Chaisson's "Astronomy - A Beginner's Guide to the Universe". Conditions: 90° F and a clear sky in the afternoon. Picture was taken from a blacktop parking lot, which probably degraded the image somewhat.